Murrelektronik’s expert engineers are continually working to develop bespoke solutions that suit your application requirements, especially when it comes to safety technology. In this article, PIF spoke to the connection experts about their safety-focussed innovations. Murrelektronik’s experienced and knowledgeable engineers offer a complete solution that not only provides the highest levels of safety, it also ensures the best price/performance ratio. Whether you are looking for a system that utilises safety relays in combination with a passive safety fieldbus module, or a fieldbus module specially designed with the highest safety standards, Murrelektronik has the ideal product for you. First up, we have the IP67 protected MVK Metal Safety I/O module. This I/O module was specifically designed with safety in mind. Alongside the IP67 protection the MVK metal is weld spatter resistant making it suitable for the harshest environments. MVK Metal Safety modules are PROFIsafe enabled. The PROFIsafe protocol is a safety expansion of Profinet and allows for the transfer of safety-related data. This means it works with Profinet communication structures on the same cabling, therefore, saving time on installation. Murrelektronik can help you to find the correct combination of safety I/O module and modular fieldbus system for you. For example, an installation based on the Cube67 modular fieldbus system can easily meet safety requirements by integrating the MVK Metal Safety with the Cube67-K3 module. The addition of the MVK Metal Safety and therefore the PROFIsafe protocol means that safe outputs now become part of the K3 module. This also creates two safety groups per module, with each housing three double-plug locations. The Cube20s is a DIN rail mounted I/O system. 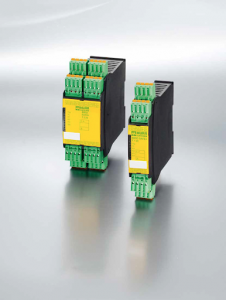 The Profinet bus node allows for both standard I/O and PROFIsafe safety inputs and outputs in one system. As with the rest of the Cube family, you can expect the highest standards of manufacturing and flexibility from theCube20S. It also saves you time thanks to its efficient and simple installation. This safety I/O is adaptable to your needs, functioning highly in both Profinet/PROFIsafe protocols or Profibus/PROFIsafe protocols. This ensures the safe transfer of safety-related data. 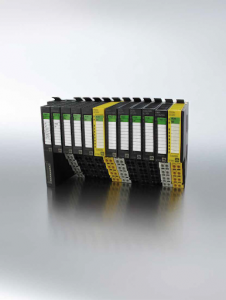 Another go-to safety innovation from Murrelektronik is their safety relay modules. Reliable, efficient and simple to install, they are the perfect solution for an extensive range of applications. Whether you’re designing a system for guard doors or pressure sensitive mats, these safety relays meet the necessary standards without requiring any programming. Murrelektronik’s MIRO SAFE+ works with a wide range of voltage inputs at 24VDC, helping it to adapt to the demands of your system. The engineers at Murrelektronik use the MIRO SAFE+ safety related module in conjunction with many passive safety fieldbus modules, such as MVK Metal, MASI and Cube to create a safety block circuit. 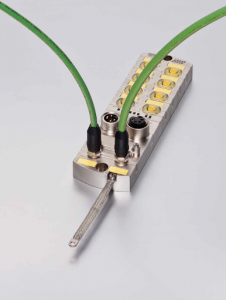 This allows you to switch off outputs safely with the addition of the safety relay module. Referred to as the “universal solution”, it’s little wonder that this safety-related relay is fast becoming the technology of choice for many people. Simply put, safety relay modules from Murrelektronik work reliably or fail safely when necessary. You can keep yourself and your machine safe with a safety system from Murrelektronik. For more information about bespoke safety technology solutions, contact the Murrelektronik team today.